Notes: Sienerth’s Senior Spring - College Hockey, Inc. Surging forward has Mercyhurst in reach of Atlantic Hockey title. Bryan Sienerth (left) has more than doubled his career point total in his last 14 games (Photo credit Ed Mailliard). 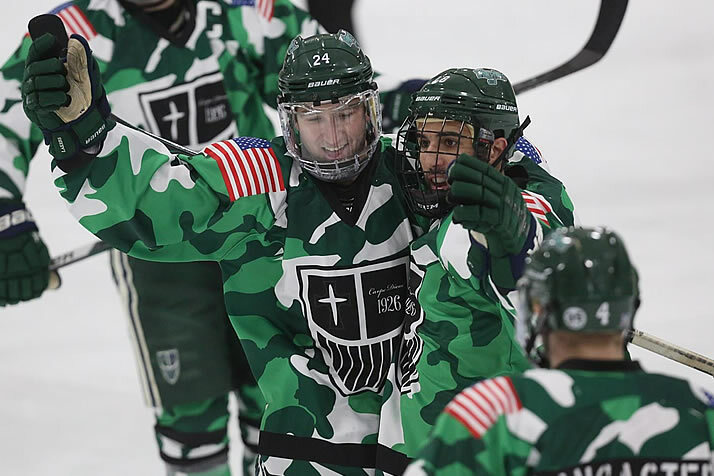 Sienerth’s senior spring – Picked seventh in the preseason, Mercyhurst enters the final weekend of the regular season in first in Atlantic Hockey and within reach of a second conference title in five years. The Lakers are a veteran group, with 11 seniors and 11 juniors on the roster – representing the largest senior and junior classes in the nation. Just 5-6-2 in the conference at the holiday break, Mercyhurst has gone 10-2-2 down the stretch, led by hometown senior Bryan Sienerth (Erie, Pa./Sioux Falls-USHL). Sienerth, who had 14 points in his first 62 career games, is making the most of his senior spring – he has 18 points in the 14 games since Jan. 1, tied for sixth nationally in that time. Goalies lead LSSU into big series – Lake Superior State has won four in a row – all on the road – entering what could amount to a playoff play-in series at Ferris state. The goaltending duo of junior Nick Kossoff (W. Des Moines, Iowa/Keystone-NAHL) and freshman Mareks Mitens (Ventspils, Latvia/Aston-NAHL) has led the way, splitting time in those four games and allowing just three goals combined. The winning streak has put the Lakers one point behind eighth-place Ferris State entering the final weekend in a conference where the top eight make the postseason. SCSU’s Colorado sharpshooter – New No. 1 St. Cloud state hosts No. 3 Denver this weekend in a series that could decide the NCHC title. The rankings were the same for a November series in Denver that the Pioneers swept. Among the Huskies looking to avenge those losses is junior Colorado native Mikey Eyssimont (Littleton, Colo./Sioux Falls-USHL/LA), who rooted for Denver as a kid. Eyssimont had a pair of goals last weekend as SCSU extended its unbeaten streak to seven games, giving him 14 goals on the year for the third straight season. He has improved his goal per game average each year. McCann makes strides at Colgate – Colgate looks to secure home-ice advantage for the first round of the ECAC Hockey Tournament as it enters the final weekend of the season in sixth place. The Raiders have been led by sophomore goaltender Colton Point (North Bay, Ont./Carleton Place-CCHL), somewhat overshadowing an offensive breakthrough from his classmate, Bobby McCann (Wainwright, Alta./Bonnyville-AJHL). McCann has nearly tripled his freshman year goal total (from 5 to 14) and leads the team with 26 points, 10 more than his closest teammates. Buckeye leaders – Ohio State has clinched home ice for the first round of the Big Ten Tournament, led by their trio of 30-point scorers in Tanner Laczynski (Shorewood, Ill./Lincoln-USHL), Matthew Weis (Freehold, N.J./Green Bay-USHL) and Mason Jobst (Speedway, Ind./Muskegon-USHL). For Weis, a senior, and Jobst, a junior captain, it is their third straight 30-point campaign, and the duo ranks seventh and eighth among active players in career scoring with 118 and 116 points, respectively. Sophomore stars at Maine – Maine is within reach of a first-round bye in Hockey East, which goes to the top five teams in the conference. The Black Bears are on a 12-5-4 run fueled by their standout sophomore duo of Mitchell Fossier (Alpharetta, Ga./Sioux City-USHL) and Chase Pearson (Cornwall, Ont./Youngstown-USHL/DET). Those two have increased their combined production by 45% from last season and helped lift Maine from its 11th-place finish in Hockey East a year ago. The New York Rangers acquired Yale alum Rob O’Gara this week, adding him to an already NCAA-heavy blueline. All of the movement leading up to the NHL trade deadline will be updated in our NHL Matchup Tool. Back-to-back hat tricks and eight goals in three games put RIT junior Erik Brown (Keene, Ont./Kemptville-CCHL) within two goals of the national lead and two goals shy of the school’s Division I record … This week’s No. 1 team, St. Cloud State, is the third team to be ranked No. 1 in the last four weeks and one of four teams receiving first-place votes this week.